The average Australian has 28 teaspoons of sugar a day. 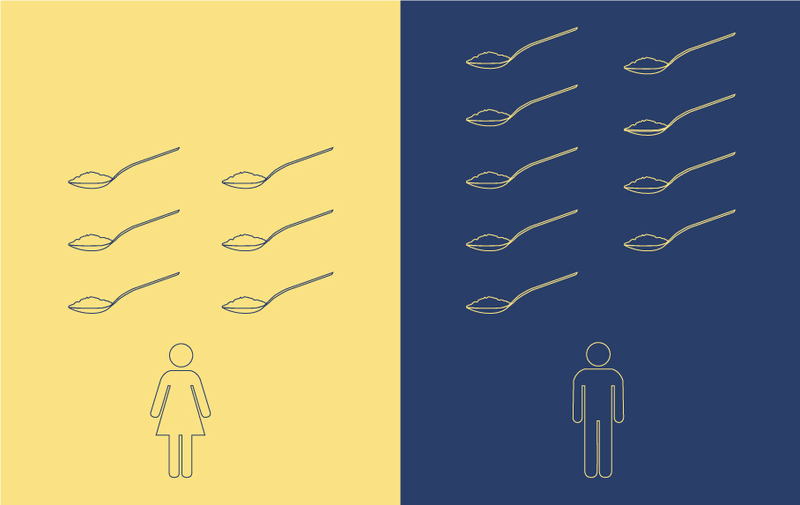 The World Health Organization (WHO) suggests we have a maximum of six teaspoons per day for women and nine teaspoons per day for men (one teaspoon of sugar is around four grams). Recent studies have shown sugar to be more addictive than cocaine. When we eat sugar, the brain releases dopamine and serotonin which boost our mood and the ‘I’m full’ hormone isn’t triggered. Our natural desire for sugar was handy back in hunter-gatherer times when we needed high-energy foods to survive. It’s not so useful today when most of us are desk-bound by day and sweet snacks are everywhere, addictive and delicious! 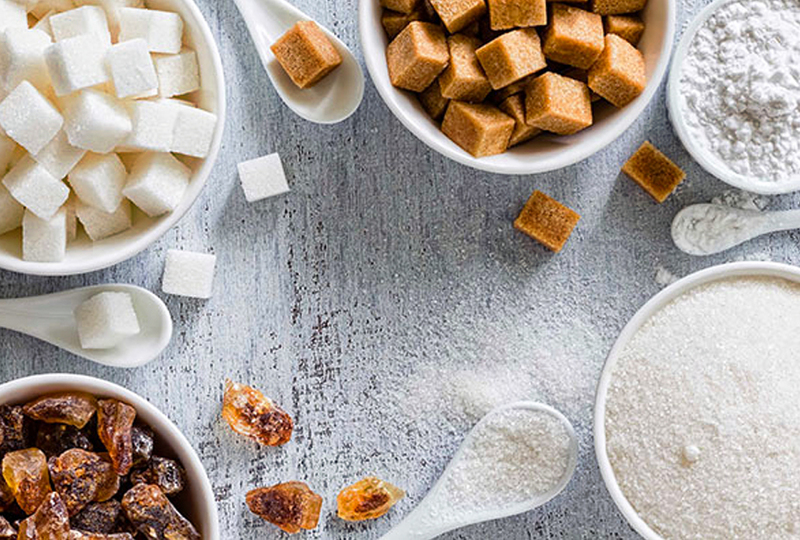 Sugar does not only refer to the crystallised grain we associate with lollies and sweet treats, it’s the catch-all name for sweet, soluble carbohydrates. Carbohydrates are broken down into glucose (blood sugar) in the small intestine. Glucose is released into the bloodstream providing energy for the body. Cells in the pancreas monitor blood sugar levels by releasing insulin to control them. If you have too much glucose, it’s usually stored as fat and can lead to metabolic conditions like insulin resistance and diabetes over time. Do I Need White Sugar? White sugar is an ‘empty calorie’ food as it is nutrient-poor and highly calorific. White/table sugar or ‘sucrose’ is a simple carbohydrate made up of fructose (fruit sugar) and glucose (blood sugar). It provides a quick spike in blood sugar levels (usually followed by a dip in energy and sugar craving). White sugar contributes to dental decay, obesity, diabetes, cardiovascular disease and dementia. Examples of white sugar laden simple carbs are fizzy and soft drinks, sweets, chocolate, biscuits, cake and white bread. Both fruit and white sugar are made up of fructose and glucose, but the sugar acts differently when consumed in fruit because fruit is a complex carb. Complex carbohydrates provide slow-releasing energy and contain other nutrients and minerals as well as fibre which helps with digestion and fills you up. The fibre in fruit changes how the body processes the sugar, slowing down digestion and metabolism, allowing it to reach the bloodstream more slowly. Whole fruit is filling because of the fibre, so you are unlikely to over consume and put on weight, making it a great go to option for a sweet yet nutritional fix! Fruit also contains nutrients and minerals which positively affect the bacteria in the stomach and intestines. Other examples of complex carbs are whole grains, beans, brown rice and vegetables. Many fruit juices as well as cooked fruit and jams are highly concentrated with sugar and their naturally-occurring fibre gets destroyed in the manufacturing process, so the sugar will act in a similar way as white sugar in the body. I Heard Fructose Is Bad? Sugar-free folk have raised the argument that fructose (fruit sugar) is the enemy. This is because fructose places its metabolic burden (the way in which it breaks down) entirely on the liver. Excess fructose is converted into fat by the liver whereas glucose can technically be used throughout the whole body. Recent studies, however, have shown glucose, fructose and sucrose all have the same effect on the body in terms of blood glucose, insulin and fatty cell production. Unlike fresh, whole fruit, these other natural sugar options lack fibre and other nutritional benefits. Studies have shown them to have the same effect on the body as white table sugar. Agave syrup doesn’t spike blood sugar levels as much, but is even higher in fructose than white sugar. Coconut sugar has a similar make-up of glucose and fructose to white sugar, so it should be seen in the same way rather than as a healthy alternative. Sweeteners generally pass through the body without being absorbed so have no calories. Artificial sweeteners such as sucralose and aspartame are growing in controversy with studies linking them to causing serious health issues. Natural plant-based sweeteners such as stevia and monk fruit are a good alternative if you want the sweetness of sugar without the calories or spike in blood sugar. They have little effect on the body at all. 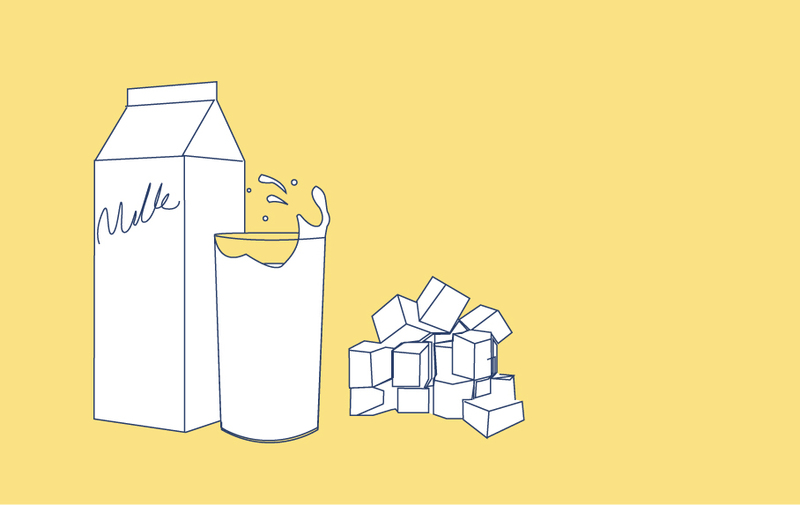 Who Knew a Glass of Milk Contains 1 Teaspoon of Sugar? Who knew a glass of milk contains 1 teaspoon of sugar? Lactose or ‘milk sugar’ is made up of glucose and galactose. Like fruit, dairy products are complex carbohydrates as the sugar isn’t absorbed quickly by the body and milk has other nutritious benefits such as containing calcium and vitamin D. If you can tolerate lactose well (a whopping 75% of us are intolerant) it can be a healthy option as part of a balanced diet. Our bodies don’t need white sugar. We need glucose for energy which is best achieved through a healthy balance of complex carbohydrates, protein and fats. We’ve put together this handy guide for how that looks across a day on a plate. Sugar is sugar in any form and should be seen as an occasional treat within a balanced diet. When you do crave sugar, opt for complex carbohydrates like fruit, vegetables or milk which will be more beneficial to your health, or plant-based sweeteners for a harmless, sweet fix. Labels show ingredients in volume order, so if sugar is at the top of the list, you know there is a lot! Other names on labels for white sugar include corn syrup or high-fructose corn syrup, dextrose or crystal dextrose, fructose, maltose, lactose, sucrose, glucose, evaporated cane juice and fruit juice.